Entre Chein Et Loup - Between Dog and Wolf Medium: 22X28 inches oil on canvas. This was from a canoe trip into Burnt Island Lake in Algonquin Park. The moon was on it's ascendency into the firmament. The shadows lengthening, deepening across the way along the shoreline. A time of tension and relaxation..
'thirty days in july' is my first book, to be published in 2013. It is a pictorial with excerpts from my journal, kept over the thirty continuous days of camping and painting in Algonquin Park in 2005. 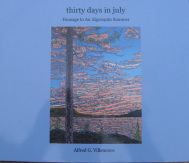 Includes images of the thirty four plein air paintings completed during the 400 km plus trip via canoe, portage and trail. 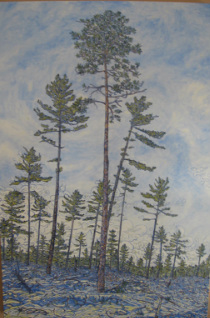 Includes images of studio works that were exhibited across the Province of Ontario in 2006-2007. Included were stops at the T.A.G. in Haileybury, Homer Watson in Kitchener and Art Gallery of Bancroft, Bancroft Ontario. Please email for details. At the Chalmers House, Canadian Music Centre, Joesph Street, Toronto. The event was a fund raiser for the Elizabeth Bishop Legacy Recording Project. 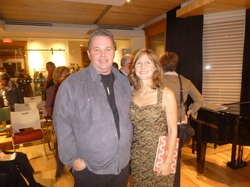 I was fortunate to have had the pleasure of meeting Acadian/Canadian Soprano Suzie Leblanc and listening to her fine performance that evening. 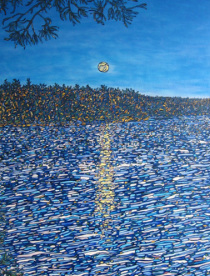 A painting I had donated was auctioned off at the end of the event. I was pleased with the results as the money will assist this very worthwhile cause. Please go to elizabethbishopcentenary.blogspot for details.